Drawing inspiration from a time when bright and audacious was all the rage, neon colored shoes are some of the peppiest and boldest footwear choices available. They're not for everyone, but they do have their time and place. Neon clothes and shoes are just as wild and glaringly bold as one might expect. Back in the 1980s, neon tinged everything from T-shirts to pumps, and was considered one of the hottest trends of the decade. Many people - even those who didn't make a living touring the world and singing to millions of screaming fans - would dye their hair neon colors. It was simply that addictive. Today, thanks to a resurgence of 80s-inspired trends, neon is back - albeit in a less outrageous manner. Designed to suit the modern woman's taste for adventure while still retaining some sense of normalcy, neon can be found in the slightest hints on everything from handbags to ballet flats. Of course, many will argue that neon is charming simply for being so crazily vibrant. To that end, there are neon styles to accommodate adventurous sorts, too. Whether fully immersed in the fluorescent stuff or merely accented by it, neon colored shoes are guaranteed to stand out. For that reason, it's a good idea to know what you're getting into before you slip into those shoes. You will definitely turn a few heads and might even start a few conversations. Gladiators: A true sign of the times, neon gladiator shoes are now readily available. While the 80s favored the ubiquitous jelly shoe, today's cool shoe is the Grecian-inspired gladiator, which features a flat sole and either sinewy or thick straps, often studded or otherwise embellished. Check out Diesel's neon-strobe sandals for an unusual take on the look. In neon pink and yellow, they look like they've been attacked by highlighters - and that's part of their charm. Try them with denim shorts and a plain white T-shirt and they'll stand out for miles. 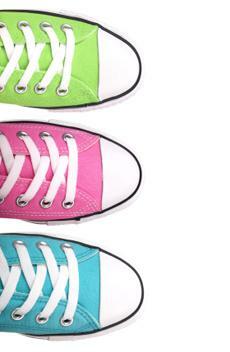 Chucks: Neon colored Converse shoes are nothing short of a true blue 80s fashionista's dream. In a range of bright hues, including acid green and hot pink, these versions of the famous casual shoe are extremely eye-catching. Worn with cut off shorts, they give off a relaxed yet playful vibe, and they're especially cute for kids and teenagers. Heels: Here's where you can get a bit more creative - and where the naysayers might change their minds about questionable neon colors on their shoes. If you opt for a basic neon heel, you can count on finding something in every color, whether your preference is electric yellow or day-glow orange. If you're a bit less likely to walk around in glow-in-the-dark heels, though, consider a shoe with a neon accent. Many modern heels feature a neon colored sole and a neutral colored upper, like Colin Stuart's peep-toe platform pumps. The butterscotch color couldn't be more classic, but the neon pink heel and button are absolutely electrifying. Flats: Neon flats may almost seem like a contradiction in terms, considering that flats are recognizing for their sweet, girlish quality. Nonetheless, anything is possible in fashion today, so neon colored flats shouldn't be discounted. A pair of flats with a neon accent is a great choice even for everyday wear. Try Marc Jacobs' fluorescent tweed ballerina flats, which are primarily polished with their classic black and white tweed, yet feature a demure pop with a neon green gem at the vamp. Given the many styles available, you don't necessarily have to be a wild child to pull off a pair of neon colored shoes. Wear shoes with neon accents in more understated settings, or go for bold with something truly outrageous at a party or even just while hanging out with friends. Either way, don't forget your moxie. Wear those bright shoes with confidence!